© Cedar’s Mediterranean Foods, Inc.
Where will the pumpkin-spice mania end? If you answered, “Not with hummus,” you’re correct. Cedar’s Foods has once again released its limited-edition flavor Pumpkin Spice All Natural Hommus (their spelling, not mine). It’s that classic pairing of a spiced seasonal orange squash cultivar native to North America and a traditional Middle Eastern bean spread that has been a staple of Levantine cuisine since the 13th century. If the combination is making you choke on your Pumpkin Spice Latte, there are two possibilities: 1) You’re simply not open-minded enough to embrace the idea of unique food fusion being packaged and sold on grocery store shelves; or 2) you understand that the concept is somewhat bizarre. 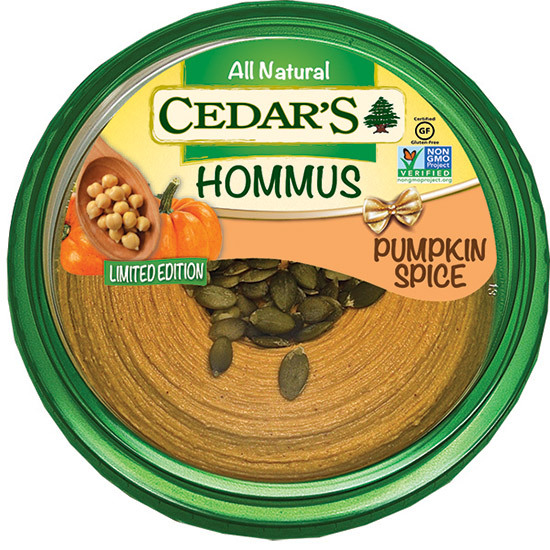 Cedar’s claims it’s “the world’s first Pumpkin Spice Hommus”—and, you know, there’s probably a reason for that. Here’s the cold, hard truth: If pumpkin spice was anything more than a marketing ploy, come autumn time restaurants would give a bottle of pumpkin spice its rightful place on the table next to the pepper and salt so we could dole it out whenever we wanted, at our own discretion. Instead, for a few months a year, companies roll out orange-colored everything, stripping us of our own pumpkin-spicing powers. They push us into buying Pumpkin Spice Oreos instead of letting us simply dump our own pumpkin spice on the Oreos currently going stale in our cabinet. From here on out, I’m pumpkin-spicing only the things I want pumpkin-spiced. You see what’s happening, sheeple? We’re being conned! All it took was pumpkin spice hummus to reveal the truth.